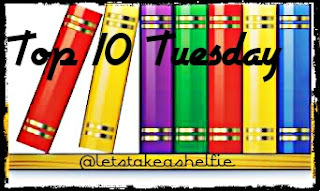 This week's Top Ten Tuesday was a movie freebie. I have always been a huge fan of Disney from their characters to their amusement parks. This week, I wanted to focus on my ten favourite animated Disney movies. Whether it was watching it in the theatre with my parents as a child or watching them with my own kids at home with a bowl of popcorn, these movies are a part of many of my cherished memories. #10 Inside Out: The newest movie on my list. I really enjoyed this movie. After watching it a few times (this happens when you have kids), it really made me realized how intelligent the writing is and really gives viewers food for thought. It speaks to mental illness and how people handle their emotions. Pretty deep stuff for a kid's movie. #9 Up - This movie makes you laugh, it makes you cry and it makes you stop to appreciate what you've got. Even though he wasn't featured much, Doug the dog was my favourite character. #8 Pochahontas - I think it's more the soundtrack than the movie, that puts this in my top ten. Regardless, my kids and I still watch it at least a few times a year. #7 Lady & The Tramp: This scene right here... you've all tried it! My parents and I used to snuggle in our living room right before Christmas every year to watch this movie. I always secretly hoped they would one day give me a dog after watch it... It never happened. Lucky for me, I convinced my husband to get a dog a couple decades later. #6 Toy Story - Who doesn't love Buzz & Woody? These characters are so memorable and incredibly hilarious. I can watch any movie in this series and be totally content. #5 Wreck It Ralph - I was born in the 80's and I love video games. This movie was made for me. #4: Finding Nemo - I love aquariums. I can spend hours in one walking around and taking in all the different kinds of marine life. No surprise that finding Nemo found a way to my heart. #3: Brave - Merida is my daughter's favourite Princess. She watched this movie everyday for almost 6 months and I did not mind. Merida is a strong character who never plays the damsel in distress. I'm happy that my young one found a role model in her. #2: Cinderella - This movie reminds me of Sunday mornings with my mom. Every week we would pop this video in to our VHS player and it would play as we my mom did our household chores. #1: The Little Mermaid - Maybe it was because Ariel's name so closely resembles my own, or maybe it's because I think I'm part fish, but, the Little Mermaid goes down as my all time favourite Disney movie. What are your favourite Disney movies? Did any of your cherished movies make my list? Let me know in the comments below. I love so many Disney films. I really need to check out Inside Out. It looks amazing! Oh I love so so many of these too!! I still need to see Inside Out though...kind of ashamed that I haven't yet. XD But I LOVE Wreck It Ralph and Brave. <33 Merida is QUEEN BASICALLY and definitely the kind of heroine princess I wish I'd had to look up to when I was small. Also so much love for Nemo and Up. I also am a total fan of Tangled and Frozen.😂 And Mulan and Robin Hood!! Disney just IS THE BEST. Here's my TTT! I suspect I'll be watching a lot of Disneys in the future with my new granddaughter! Thanks for your recommendations.